…states the Toyota (and I am assuming Japanese) translation of STANDARD is more of a scientific comparison definition than how we think of the word as “a rule” or “prescribed way of doing things” (page 114). What is the difference between standard work and standardized work? They are the same thing. It was called “standard work” by the Japanese consultants from the Toyota supply chain who were teaching TPS overseas long before Toyota made TPS popular, so many people who learned their lean terminology between 1988 and 2004 or so call it “standard wok” and TPS consultants who come directly from Toyota tend to call it “standardized work”. Personally I think “standardized work” is an inferior translation of the Japanese term and that “standard work” is more accurate. “Standardized” means something has been brought into conformity with a standard, while “standard” means a norm or requirement. Standard work is not so much conformity against a standard time or method so much as an agreed basis for performing and improving a process. At English-speaking Toyota sites they call it “standardized work” and much of the recent literature references this term. Before we dive into the world of standards, it may be useful for the reader who is relatively new to standard work / standardized work as part of the Toyota Production System to read an article two from past years: Three Essential Supervisor Skills for Standard Work. If you are adequately familiar with standard work and have no fear of exposure to foreign languages, read on. Now we dive off of the deep end of Japanese linguistics and learn the finer points of the three (but not the only three) different ways to say “standard” ways. Japanese writing borrows from the Chinese script. Each symbol has a meaning as well as a sound. These symbols can be used by themselves or combined with others to make words, depending on the symbol. First, let’s look at what’s common between the three different ways. So like in many languages including English, prefix+suffix=new word. All three terms for standard end have the same 準 (jun) prefix. When this “jun” character is attached as a suffix to other characters as in the examples below it means “something which corresponds to, conforms to, or the level of something”. By looking at the different ways we can say “standard” in another language we can understand how we think of this concept in our own language, thereby learning how to clarify what we mean and express. The following are common terms that use 基準 to mean standard as a basis or foundation. Note that you can have standard work for doing the audit, which will use information from and comply with the audit standard. Work should be done in a standard way conforming to some basis of foundation. However, this is not the meaning of standard we use to discuss standard work as part of the Toyota Production System. This type of standard is used as a noun and can mean very literally “water level” as well as levels (standards) of education, housing, living, etc. When we say “standard work” in the Toyota Production System we do not use this second type of standard because we do not mean a performance level or standard. The interesting thing about the word 標 included in the third type of standard is that it is used in various other words such as target (目標), coordinate (座標) as in y axis coordinate, indicator (指標) as in economic indicator, road sign (路標) and trademark (商標). All of these have the meaning in some way to show, indicate or make visible. A standard should inherently make the norm visible. As used in the term “standard work” we must think of “standard” as and “evident norm” and make this standard visible. We can understand the intention of “standard work” as a visual management tools for continuous improvement only by recognizing the deliberate choice of Japanese words used. In what I am suspecting is another one of Taiichi Ohno’s clever but potentially confusing neologisms, there is a fourth standard, though this one is non-standard Japanese. The little known “standard work” is called 表準作業 (o-mo-te-jun sagyou) and means “document what you see”. It pronounced in Japanese exactly the same as the word for “standard work” but means “the work documented as is”. The word 表 (omote) means “surface, apparent, what is on the outside, what is visible”. It is also pronounced “hyou” and is identical when combined with “jyun” so 表準 is Ohno’s wordplay on 標準. When they say at Toyota to document the 表準作業 (omote sagyou) first it means to observe and document the work as it is, no matter how bad it is, rather than documenting “as it should be” out of embarrassment. Then perform this work as documented and observe what is difficult, dangerous or ambiguous and then kaizen these points. Now document the 標準作業 which is the “standard work” which is based on takt time, work sequence and standard work in process. The concept of omote-jun as a standard is important simply because documenting the current method as standard is the very starting point of kaizen. Taiichi Ohno said that when you create standard work it was OK for it to be less than elegant, as long as you used this standard as a basis for continuous improvement. Standard work is not the idea of a certain fixed basis or foundation of work. Neither is it the idea of performing to a certain level or standard. It is the idea of creating the evident norm as a basis for making abnormality obvious so that kaizen can thrive. Confused? Read on in an article from May 2007: Standards, Abnormality and the Ideal. If that doesn’t clear things up, ask Gemba. Thanks for the outstanding, exhaustive (and just a bit exhausting) explanation! Now I now what page to link to on my blog when I reference standard work. Informative and thought-provoking post, but I’m mystified by the music/TAB notation at the top. Pardon my obtuseness, but how does it connect? It is a jazz standard. Thank you for this. It is absolutely brilliant. The visual aspect of standard work inherent in the translation is an eye opener. I have always used visual workplaces and standard work and understood how they are related BUT it is another thing entirely to add the two together in the definition. This is an outstanding post. Thank you again. Ask GEMBA As part of the Nuclear support industry our customer base is committed to Human Performance, the elimination of error as it is a natural part of being human but also ensuring that the organization itself is not the cause of creating an environment that contributes to the potential for human error by allowing “Error Precursors” to go unmitigated. I am trying to marry the commitment to lean with the focus on Human performance. The focus of lean to break down a process to its simplest components to eliminate error and Human performance to eliminate the precursors of error, the work environment, individual capabilities, task demands, and human nature. Any suggestions? We are looking both as tools to support our overall initiative of ISQO, excellence in Integrity, Safety, Quality and Output. 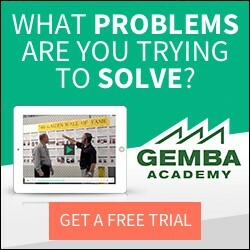 Here is my reply to your question: Ask Gemba. I just want you to know th elong lasting power of this post. I have come back and re-read it multiple times just to continue to gain a deeper understanding. Thanks again for this awesome post.